For the fourth time this year, Knoxville-based Miller Energy Resources has tapped investors for a fresh infusion of cash needed for general corporate purposes. Miller announced Tuesday that it raised $25 million from the sale of 1 million shares of “Series D” preferred stock. The sale was completed Sept. 30. The oil and natural gas company previously raised $32.6 million in stock sales in February, May and July. Miller has struggled financially in recent months. The company reported in July a loss of $13.1 million for the fourth quarter of fiscal 2013, more than half its loss for the full 2013 fiscal year. The net loss attributable to common stockholders was 31 cents per diluted share, up from a loss of $8.4 million, or 20 cents per share, in the 2012 fourth-quarter, the company said. Click here for Miller’s news release on its recent stock sale. Click here for more on Miller’s latest financial report. This entry was posted in Miller Energy Resources and tagged exploration, investors, Miller Energy Resources, natural gas, oil, production, stock sale on October 1, 2013 by Roger Harris. Revenues were up, but Miller Energy Resources Inc. lost more than $9 million in the quarter ended July 31, the Knoxville-based oil and natural gas company reported Monday. Net loss attributable to common stockholders was $9.4 million, or 22 cents per diluted share, for the company’s first quarter of fiscal 2014. That compares to a profit of $200,000 in the same period a year ago. Revenues for the recently ended quarter rose more than 56 percent to $13 million from $8.4 million in the first fiscal quarter the prior year. Revenues were up on increased production and higher oil prices. Average realized oil prices rose 5 percent to $104.57 per barrel in the first quarter compared with $99.59 in the prior year period. The revenue increase was off set by a 44 percent increase in costs and direct expenses and “an increase in interest expense due to higher debt balances and less interest capitalized; and a loss on commodity derivatives,” the company said. Despite swinging to a first-quarter loss, Miller CEO Scott Boruff gave an upbeat outlook based on increased production. “We are continuing to see major increases in production in Alaska. In the second half of the first quarter, we brought our RU-2A well online, which has been our highest producing oil well to date. … (Contributing) $4.1 million to our revenues for the quarter,” Boruff said in a statement. Progress also is being made on bringing other oil and gas wells into production, Boruff said. Miller Energy is an oil and natural gas exploration, production and drilling company with operations in Alaska’s Cook Inlet and in Tennessee’s Appalachian Basin. This entry was posted in Miller Energy Resources and tagged Alaska's Cook Inlet, loss, Miller Energy Resources, natural gas, oil, revenue, Scott Boruff, Tennesee Appalachian Basin on September 9, 2013 by Roger Harris. It’s been a busy Monday for Miller Energy Resources. The Knoxville-based oil and natural gas company announced that it intends to raise additional funds in a follow-on public stock offering. 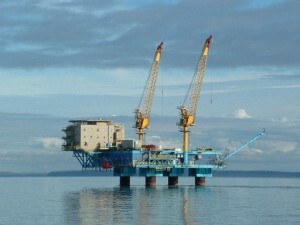 It also announced that its wholly owned subsidiary Cook Inlet Energy has inked a new commercial gas sales agreement. This entry was posted in Uncategorized and tagged Cook Inlet Energy, exploration, Miller Energy Resources, natural gas, oil, production, stock on May 6, 2013 by Roger Harris. It’s always nice when you can find talent close to home. Knoxville coal company Xinergy Ltd. announced that a former Knoxville oil company executive will join Xinergy’s leadership team. Robert Gaylor has been named Xinergy’s new senior vice president of investor relations, the coal producer said in a news release. Gaylor previously was senior vice president of investor relations and senior vice president of acquisitions and development with Miller Energy Resources, an oil and natural gas exploration and production company. This entry was posted in Uncategorized and tagged investor relations, Miller Energy Resources, Robert Gaylor, Xinergy on April 4, 2013 by Roger Harris. Oil and gas company Miller Energy Resources has completed a public preferred stock sale that raised $15.75 million. The Knoxville-based company sold 685,000 shares at a price of $23 per share. The 10.75 percent Series C Cumulative Redeemable Preferred Stock will trade on the New York Stock Exchange under the symbol MILLprC, Miller announced. This entry was posted in Miller Energy Resources and tagged Miller Energy Resources, preferred stock, stock, stock sale on October 8, 2012 by Roger Harris.